Could your garden do with a bit of a makeover? With longer than a century and a half supplying Europe with top-quality garden supplies at unbeatable prices, Thompson & Morgan are the leading online supplier of seeds and bulbs. Whether you’re in hoping to grow begonias, beetroots or blueberries, Thompson & Morgan have everything you need to help your garden bloom. With an astonishing catalogue of seeds, including thousands of varieties, if it grows in the ground, there’s a solid chance Thompson & Morgan sell it. From spiky cacti to colourful shrubs, they’ve got everything you need. What’s more, with an extensive choice of fruits and vegetables, Thompson & Morgan can help you grow the freshest, most organic produce possible. There’s nothing better than enjoying the delicious freshness of home-grown foods, so why not your hand at cultivating asparagus, artichokes or apples? From sweet tooths to savoury soups, Thompson & Morgan have something for everyone. How do I use my Thompson and Morgan voucher code? Sign up to Thompson & Morgan’s newsletter to receive exclusive news and deals. Do Thompson & Morgan have a print catalogue? Just like they did in 1855, Thompson & Morgan still offer free print catalogues. Simply request one from their website and it will be sent out to you. How can I pay for my Thompson & Morgan order? Thompson & Morgan accept Visa and Mastercard, or you can put in a mail order and pay by cheque. Is there a Thompson & Morgan stockist near me? You can find your nearest Thompson & Morgan seed stockists here. Do I need to create a Thompson & Morgan account to order? You can easily checkout without making an account, and only after checkout will be offered the option to join. Delivery costs vary depending on your order, see here for details. If you’re not happy with your order, products must be returned immediately in order for a refund to be issued. With more than 160 years of supplying gardening supplies, Thompson & Morgan have established themselves as the UK’s leading plant and seed suppliers. 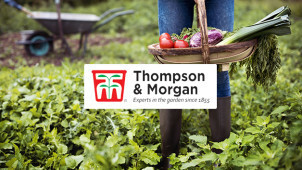 Whether you’re green-fingered or still a budding gardener, grab some great savings with a Thompson and Morgan voucher code. Transform your garden into a veritable Eden, with Thompson & Morgan’s incredible range of flowers, fruits and vegetables. They’ve also got all your garden odds and ends covered, from chainsaws to chimeneas, so make Thompson & Morgan your one-stop shop for everything your garden needs. Thompson & Morgan put their roots down in 1855, and has growing and growing in popularity ever since. Their extensive catalogue of seed, bulbs and plants has been helping gardeners around the globe create their ideal garden for more than 160 years. More than just a supplier, though, Thompson & Morgan have made some important horticultural breakthroughs, from the gorgeous, ruby-red Rudbeckia Cherry Brandy flower, to the world’s first patio summer lilac, the Buddleja Buzz™. Have a look at Thompson & Morgan’s amazing selection of garden accessories. There’s nothing better than toasting marshmallows in your stylish firepit, or celebrating the arrival of summer with that first barbeque, so grab a Thompson and Morgan discount code today to make great savings on some of their fantastic items. From patio heaters to pizza ovens, transform your outside space with an amazing deal from Thompson & Morgan.